con_cetta is the first Italian artist on Zymogen, and we're extremely glad to have such a great musician representing the label's home country. Giuseppe, con_cetta's real name, is from Sicily but now lives in Milan, which is the leading commercial and financial center of Northwestern Italy. Sclerosis is his debut under this moniker and could be seen as Giuseppe's attempt at escaping the chaos of the industrial metropolis, generally seen as lacking the color and poetry of everyday life. This release is full of passion while the contrast between the two extremes is clearly audible and molded into the sound. Giuseppe explores many different languages in the field of electronic music, but his composition process is structured in a particular way. He begins with samples taken from different recording sessions and then processes every sound using Gleetchlab, a software programmed by Tobor Experiment, which, with its very intuitive interface, gives Giuseppe all the possibilities to express his feelings and imagination in a digital format. The first track '2.53' slowly evolves from hypnotic samples into a string symphony over white noise pulses. 'Hexagram', features a collaboration with Nicola Ferloni, a guitarist from the indie band 'Go Down Moses', whose guitar is dismantled through processing, resulting in something completely different. Another significant track, 'Calendaexl', is a great example of composition with different layers which slowly appear on the surface. Sclerosis is only con_cetta's first step in musical research, but in June 2008 the well known British label Moteer will release his debut album, entitled Micro. Keep your eyes peeled for this name. May is the time when the nature round us bursts with different colors of life, we roll in the sunlight and keep defending our warm sunny mood from any negative factors. Unconsciously we forget about all the troubles we had earlier, any problem gets lost among general awakening of life and energy. It's symbolic that in this very state of mood I listened to the music of the Italian musician con_cetta for the first time. His new album Sclerosis strengthened my craving for unity with nature and concentrated my attention on landscapes and sounds. The album was released on Italian net-lable Zymogen engaged in releasing pure intelligent experimental music, particularly microelectronics. Each new release is a well-prepared, integral work of several musicians from all over the world. By the way, an interesting fact - con_cetta is the first Italian in the label's musicians list. The author admitted that his music is mostly the interaction of his own field records' fragments and algorithms of the program Gleetchlab which includes various options for sound splitting, penetrating into its structure and future microscopic changes. Indeed, Sclerosis is the deep penetrating into the very depths of nature. We are able to hear its deepest vibrations, feel its breathing and see the tiniest changes. Your listening gradually turns into a walk through some 'digitized' wood with minimal approximation and feeling of subtle elements of its structure. The cover of this album is worth attention as it reflects its concept very well. Examining the cover and listening to this living ambient, which has already experienced the algorithms of glitch-treatment, you can easily escape from the fuss of a big city and merge into the microstructure of the surrounding nature. Qual'è il confine tra la musica elettronica cosiddetta 'colta' e le sonorità create da giovani artisti autodidatti? Esiste poi? A sentire certi dotti critici musicali ovviamente la questione proprio non si pone, inviterei perciò chi la pensa così ad andare ad ascoltare l'ouverture con la quale Giuseppe Cordaro aka con_cetta apre il suo nuovo lavoro per Zymogen. All'interno di "2.53" si dibatte maestosamente l'anima silenziosa di chi ha dimestichezza con il suono contemporaneo, di chi sa come comporre suoni che non andranno ad occupare il solito spazio dedicato all'illuminato compositore di derivazione 'club-culture'. Nelle tracce di "Sclerosis" Giuseppe riesce a condensare quello che è stato il suo percorso sperimentale, un tracciato sonoro che lo porta a pubblicare per l'Inglese Moteer il suo primo cd proprio in questo periodo. It’s a fascinating 44-minute venture for the ambient escapist. Feeding an assembly of various recordings through the art of electronic processing, Sclerosis is a powerful piece of audio-expression, comparable to Fennesz and Tim Hecker in its vast array of digitalised timbres. It’s as observant as it is contemplative; absorbing distinctive influence from the cold, industrialised surroundings of the artist, as well as pouring his own personal reflections into the output. Opener “2.53” stands as a solid example - founded on the hydraulic repetition of factory machines, forming a percussive backdrop to the various glitches and gurgles of the foreground, as well as fusing harmoniously with the poignant string section rising from beneath. As the album progress, this artist-environment contrast becomes ever stronger. “Sad.ay” combines its thick chordal surges with clusters of glimmering drones, whilst “Openness” is appropriately desolate, its sparse layering making a welcome contrast with the rest of this release. For me, Sclerosis only falls down when tempo is introduced, hindering the album’s ability to abolish the concept of time from the listening experience - as “Hornplant” establishes a steady pace with a quirky 4/4 rhythm, I find myself more inclined to the uncompromised fluidity of the other pieces. Thankfully, the final two tracks that follow more than make up for this slight quality dip. In particular, “Calandaexl” is a mightily immersive album closer; delicate, looped electronics, patiently gathering textures to form a flourishing expanse of sound processing, decorating every fraction of the frequency spectrum. The fade out feels like a perfect ending, taking this track beyond its 9-minute playing time and into the infinite. Following the conclusion to Sclerosis comes a real sense of satisfaction; partially due to its sturdy composition and gorgeous sense of harmony throughout, but also because this excellent con_cetta debut is available for free download. I strongly recommend that you take the time to submerge yourself in it, and know that when the time comes to part with your cash for his future efforts, the purchase will be undoubtedly worth it. Zymogen est un netlabel dont on suit avec attention toutes les sorties, et même si cette structure italienne ne fait pas beaucoup de bruit et sort plutôt des productions aux contours expérimentaux, avec des artistes travaillant autour de sonorités électroniques et acoustiques, on est souvent heureux d’entendre des choses passionnantes en provenance de ce netlabel. Si la superbe compilation "Sky Diary Edits" reste la pièce maîtresse de Zymogen, on ne s’empêchera surtout d’admirer l’album de con_cetta qui propose 44 minutes d’une musique panoramique, soit 8 titres beaux comme des paysages naturels, composés à base de guitares préparées, de field recordings, de boucles, de sonorités glitch, de synthés... Tout ça est très doux, les titres s’égrènent tranquillement, sans heurt, comme le torrent à travers la montagne. Rafraîchissant. Sobresaliente debut de este artista italiano en Zymogen; netlabel que esta alcanzando últimamente cotas elevadísimas de calidad sonora y elegancia conceptual. usando un software llamado gleetclab que por el resultado obtenido habrá que tener en cuenta de aquí en adelante. Sclerosis esta compuesto por multitud de capas o atmósferas sonoras tanto melancólicas como oscuras o inquietantes; todas ellas muy intensas. Sonidos que parecen fluctuar entre lo orgánico y lo electrónico, el caos y el orden, lo emotivo y lo puramente formal. Ahora lo tienes en mp3 o flac (free lossless audio codec) audio comprimido sin perdida para los muy exigentes, ya que el mp3 esta a una calidad de 320. Una verdadera joya del net-ambient, muy recomendable. Un buen disco para acabar un día cualquiera. The latest addition at Zymogen Netlabel is Italian sound sculptor Giuseppe Cordaro aka con_cetta. 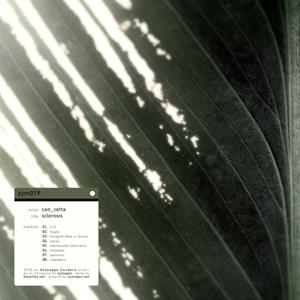 His album is entitled "Sclerosis" and although sclerosis botanically describes the decay of leaves to the bare meshwork of nerves (see the artwork), Cordaro’s Ambient compositions are rather rich in tone and texture. Filippo Aldovini, the smart guy behind Zymogen, has a sovereign feel for choosing the right music for his label. If you make up a compilation including Zymo folks Letna, Lezrod and Marihiko Hara, people might doubt there’s more than one artist featured at all. Taking place between the later two, con_cetta fits this musical terrain just perfect. Harmonious Ambient drones, spiced with glitch and field-recordings, how does that sound to you? The album opens with the hypnotizing string-miniature "2.53" that sounds like Arvo Pärt underwater. "hexagram" is a dense meditation on processed guitar and different high- and low-frequent noises which surprisingly make up a smooth listen. The song features Nicola Fernoli of Posthardcore outlet Go Down Moses on guitar. Afterwards, "sad.ay" is back with a dense piece of synthesizer Ambient, including echoing sine waves, a mesmerizing synth loop, songbirds and white noise distortion. For "hornplant", con_cetta approaches Indietronica from an Ambient point of view, introducing a plain and beautiful texture to rattly sample beats. "Sclerosis" closes with the magnificent "calendaexl", the orchestral counterpart of "hexagram". When Lezrod sounds like the creaking ground below and Marihiko Hara is the conductor of ascension, Cordaro is capable to be both textural noisy and heavenly harmonic. Not as beautiful as Hara and not as microscopic as Lezrod, con_cetta is the missing link of experimental Ambient music. The latest two sparsely minimal full lengths take Zymogen in close connection to such labels as 12K, Line, Spekk, Room 40, Anticipate... joining the broad acceptance of an essential ambient goal. The first net-release comes from an Italian author, first in the Zymogen roster: con_cetta defines the awareness escaping the chaos of the industrial metropolis, completing organic task that will improve the surroundings, in defining of a document of a better environment. Letna, however, is focused on picturesque sound wall, emitting signals from an extremely anti-climax territory. A line of emotionally mature soundscape' experience with field recordings that engage private relations, nostalgic overviews and meditative states. Ayer después de un dia durísimo de curro escuché este trabajo de vuelta a casa. Algo conseguí, desconectar un poquito, solo un poco y no porque la música no invite a ello, sino porque el dia fué duro de verdad. Hoy seguiré escuchando esta última referencia de zymogen, a ver si las propiedades desconectantes de esta música hacen efecto a base de insistir. Suerte que ya es viernes. Como de costumbre una calidad sonora impresionante, al igual que las composiciones, con atmósferas basadas en bucles y excelentes sonidos. Bien por este artista italiano que debuta en zymogen, esperamos más. il y avait le numéro 19 de chanel...il conviendra désormais de compter avec ce même numéro pour le label de modène - construction ultra délicate, sclerosis est non seulement la démonstration de la possible cohérence des extrêmes, mais il est également soucieux d'un magnifique ordonnancement narratif et mélodique - entre expérimentation et séduction, l'accord parfait. Back in January 2008, MANTIS showcased Filippo Aldovini and his netlabel Zymogen.net. Well this is their first release this year: zym019, by con_cetta and I heartily recommended you get on the case and download this. I’ve been listening to zym018 (Letna - Tisza meets Dunav) quite a lot these past 2 weeks and really am in awe of this label. Filippo and crew, keep it up, beautiful sound, crafted and sculptured into a full artwork package for zero of your Earth pence. You couldn’t really ask for more could you.